Cheers to N.C. Beer Month! Greater Raleigh is celebrating N.C.&apos;s booming craft beer industry throughout Apr. One of the biggest beer events occurred on Apr. 13, World Beer Festival Raleigh. The festival is in downtown Raleigh’s Moore Square and features more than 100 local and national craft brewers. 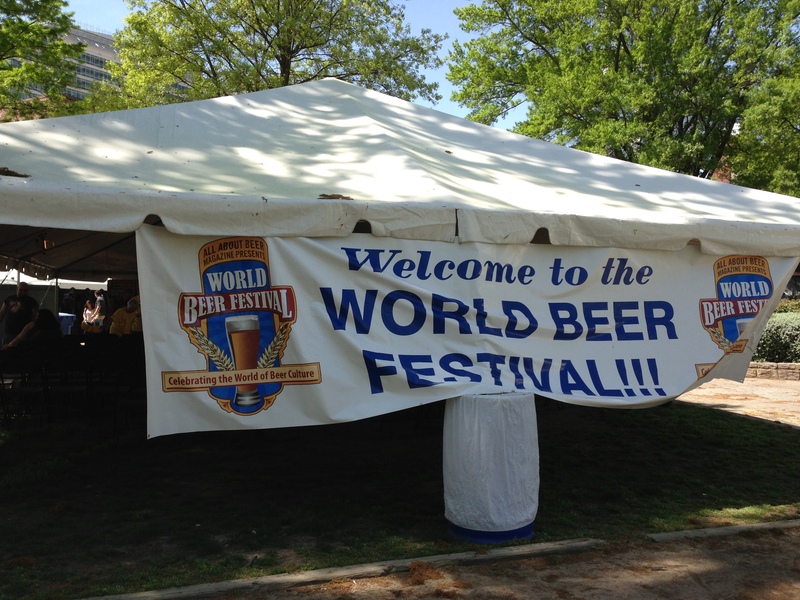 World Beer Festival Raleigh attracts numerous visitors and locals. Tickets sell quickly and I advise you to purchase your tickets well in advance for next year. I attended the Apr. 13 afternoon session of World Beer Festival Raleigh with a group of my friends who also love beer. 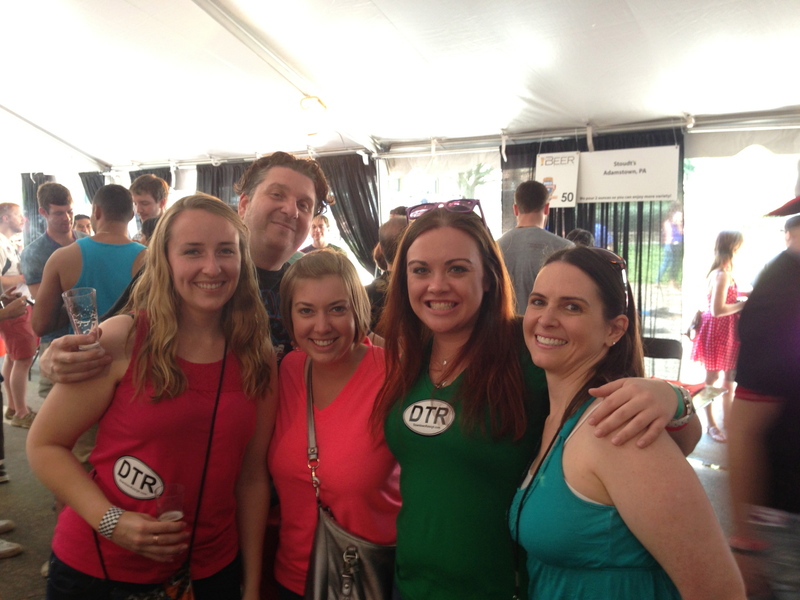 Beer lovers are the best people to bring along to World Beer Festival Raleigh, obviously! The afternoon session was from 12noon-4pm and the evening session was from 6-10pm. With a $45 general admission ticket, I received a World Beer Festival Raleigh tasting glass, unlimited 2-ounce tastings and a festival program. Plus, the money I spent on my World Beer Festival Raleigh ticket helped to support a great cause. Artsplosure was the benefactor, an organization responsible for orchestrating First Night Raleigh on New Years Eve. This year, World Beer Festival Raleigh featured more N.C. breweries than ever before. I always enjoy meeting local brewers and discussing my favorite adult beverages with other beer enthusiasts. 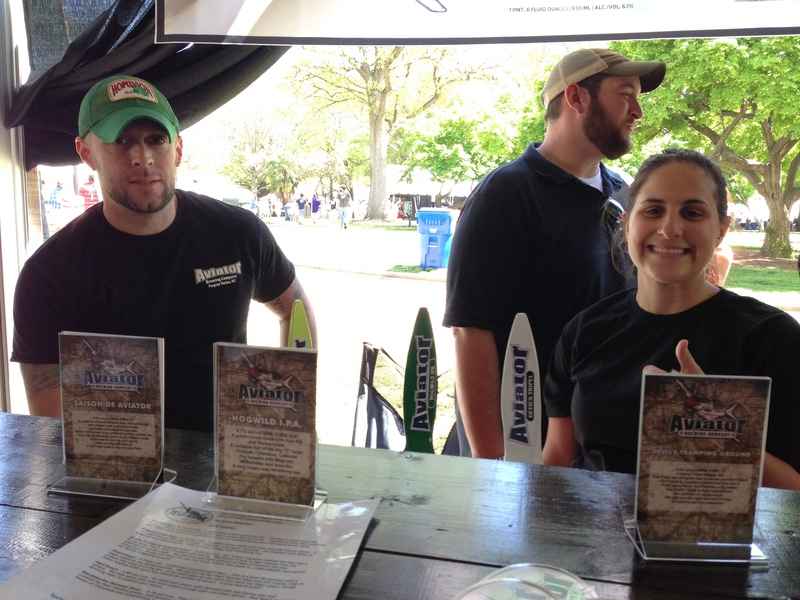 Two large tents were set up at the festival, which featured only N.C. breweries. 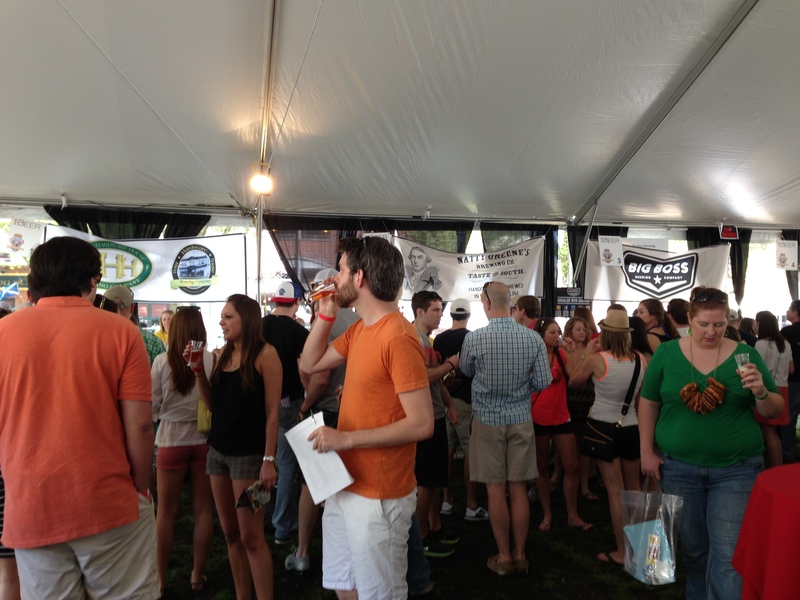 The tents were packed with people anxious to taste the wonderful craft beers N.C. has to offer. Many of the local breweries tapped special kegs specifically for World Beer Festival Raleigh. I found myself spending the majority of my time during the festival in the two N.C. beer tents. After all, my goal is to drink one N.C. beer each day during the month of Apr. in honor of N.C. Beer Month! Let&apos;s be honest, I was able to easily accomplish my goal at World Beer Festival Raleigh. I used the Untappd application on my iPhone to "check-in" all of my beer samples. Due to the excessive amount of time I spent in the two N.C. beer tents I earned the special edition N.C. Beer Month Untappd badge. I also talked to many of the Greater Raleigh breweries who were pouring samples at the festival and learned about new seasonal beers coming out soon in time for summer. One of my highly ranked beers was the Devils Tramping Ground Tripel by Aviator Brewing Company, which is based in Fuquay-Varina. 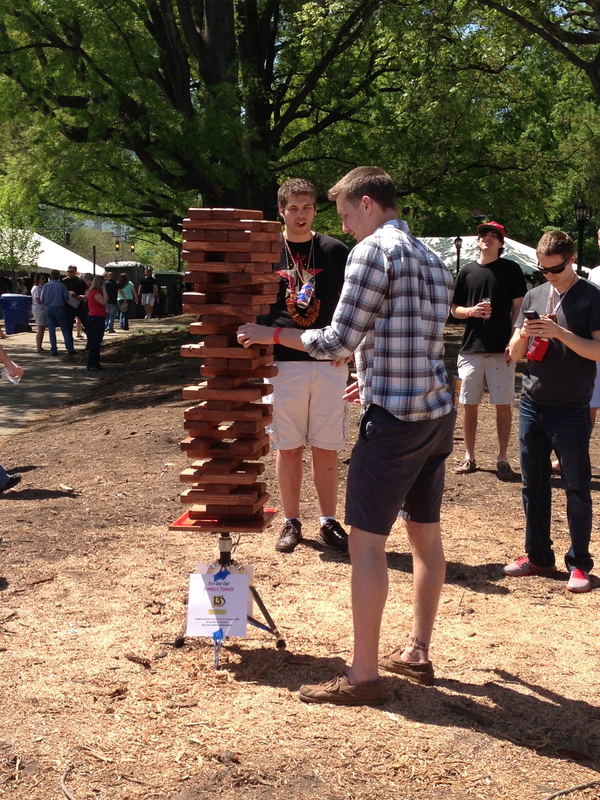 After spending the first two and a half hours in the N.C. beer tents, we went outside to enjoy the sunshine and stumbled upon a life-size jenga game. Lucky B&apos;s Bar sponsored the fun games, which attracted quite a crowd of spectators. After watching the jenga tower topple over, we made our way to the next tent. I sampled the delicious Racer 5 IPA by Bear Republic Brewing Co., a brewery from Healdsburg, CA. I also found one of my new favorite beers, an American Porter called the Edmund Fitzgerald by Great Lakes Brewing Co. 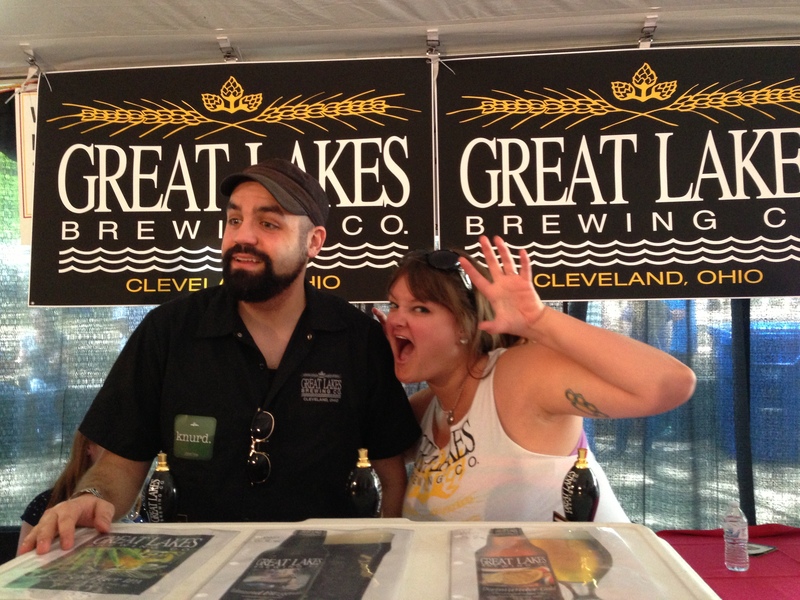 The company is based in Cleveland and the employees working the booth were quite entertaining! World Beer Festival Raleigh is a great way to learn about craft beers and discover some of your new favorites. So, start perfecting your pretzel necklaces and be sure to purchase a ticket as soon as they go on sale for the 2014 World Beer Festival Raleigh.